Carriage Clocks are real masterpieces of engineering. 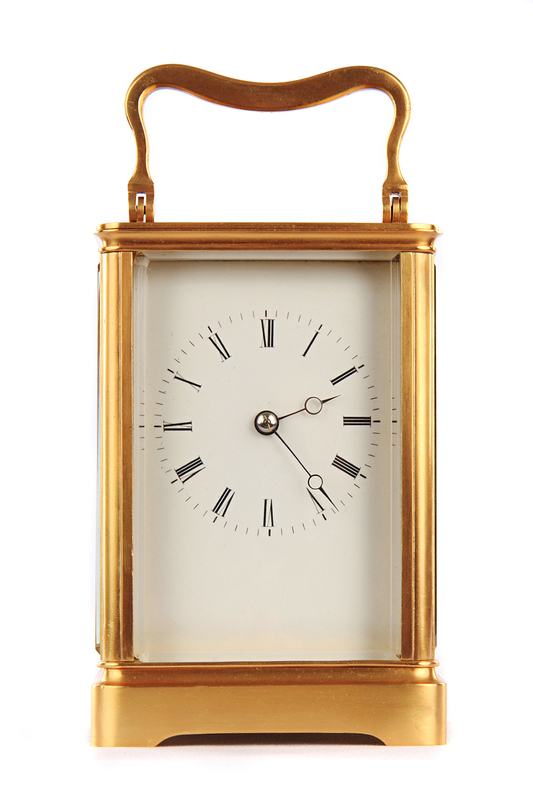 Characteristically heavy, they most often have rectangular cases with a glass front and glass sides as well, these clocks are amongst the most collectible of all clocks. Made predominantly in France and the UK, there were variants produced around the world. 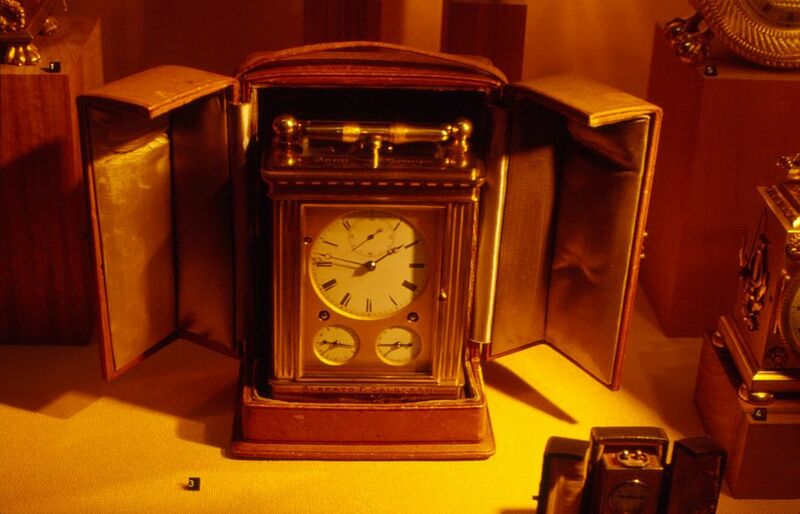 French Carriage clocks usually have a heavy case made from brass, a base unit, four pillars, a top plate with the all important handle to carry it around – usually in a horse drawn carriage on journeys! The dial was almost almost always white enamel with a plain clear chapter ring. Some versions had an auxiliary small alarm dial. The case came fitted with glass panels (usually beveled) on all sides including a large door at the back. The top also had a glass window under the handle where you could see the all important ‘escapement’! The escapement is what became the most characteristic and telling features of the carriage clock. It was made by specialists and placed horizontally on the top of the main movement while the rest of the works were mounted vertically in the traditional manner. The horizontally placed escapement insulated the delicate balance from the bumps and shocks that would almost certainly damage any other escapement while the carriage bumped along the dirt roads in those days. Carriage clocks spawned an industry of their own, from movement makers who made the larger parts and assembled the complete clocks. Other parts like the platform escapements were made by specialists who did nothing else. The escapement is the actual timing mechanism that gives the clock its timing accuracy. It measures time by the to and fro motion of a vibrating balance wheel – kept in motion by by a lever that very gently nudges it every time its direction of rotation changes. The lever is in turn actuated by an escape wheel that provides the nudge or impulse to the lever while it is itself constrained to move one tooth at a time by the rocking action of the lever. There were separate case makers who made the standard elegant brass cases and there were some who made more elaborate cases with enamel, engravings and sometime decorated panels. The enameled dials were another industry and so too were the felt lined carrying cases for additional protection. Keys were double sided sometimes –the larger square for winding and the smaller for setting the time! 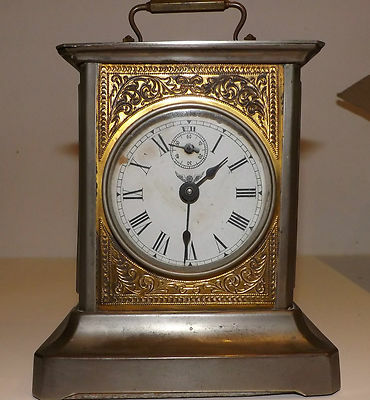 There were lower priced versions of carriage clocks made in America and elsewhere that are equally collectible. 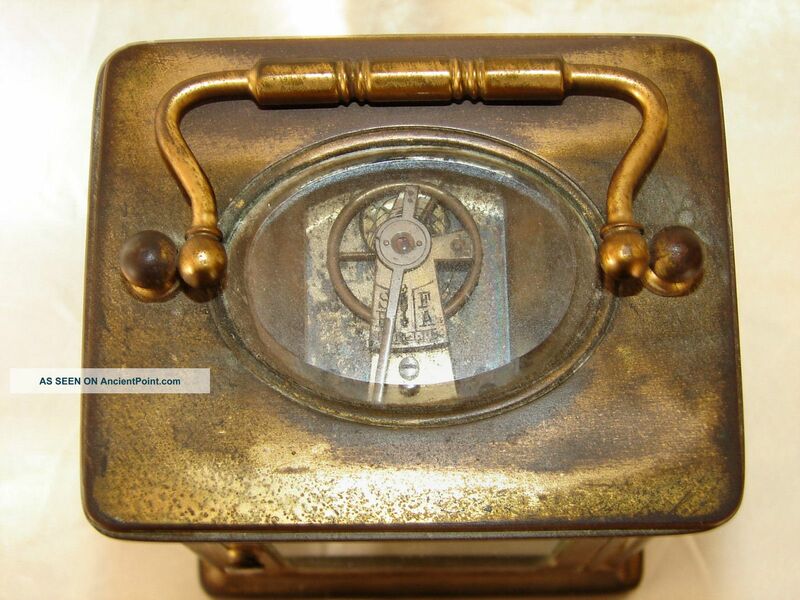 Cases were made of stamped sheets of thin brass or iron and then nickle plated. Movements were more traditional and did not have a platform escapement. Almost all these clocks had pin lever escapements that were easier to mass produce. The stamped cases sometimes had very ornate decorations in relief. To add more character, most had a striking mechanism and some were fitted with musical alarms that concealed in an aperture in the base. The nature of this precision timepiece led to some carriage clocks being made with additional complications with alarms and repeater mechanisms. There were some that had complicated calendar mechanisms as well. 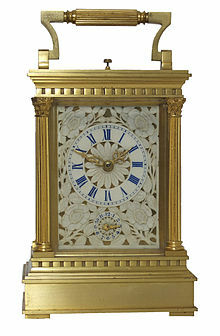 This particular clock became such a classic in terms of design elegance as well as function, that production continued well into the twentieth century and there are some makers who continue to make them to this day. Unlike most other clocks, carriage clocks give you a peek into the mechanism so that you can almost always see what makes them tick!